I'm trying to connect to a ​ZNC server I'm running. I run ZNC 1-beta with SSL, and have it listen to a custom port. Pidgin 2.6.10 with the IRC Helper and IRC More plugins active. The "use SSL" checkbox applies to the connection to the IRC server, not to some "auth name" (as you can see in the screenshot, I can login just fine with a bogus auth name). Perhaps this checkbox should be moved next to "Port:" or even on the Basic tab. The real username that I can login with is the one from the Advanced tab, not the one from the Basic tab. Instead, the one from the Basic tab seems to be interpreted as a channel, because after I login to the server, I get a message "no such channel: <whatever I put in the Basic username field>". The "Nick password" doesn't seem to have any effect. I can login with it being one character. What do the "Auth name:" and "Nick password:" fields do? To summarize, it would help to rearrange these fields, rename them in a unique way (e.g. no two "Username" fields), group them in fieldgroups where applicable, and have tooltips for each, explaining precisely where they apply. IRC_settings_are_a_mess.png​ (73.9 KB) - added by dandv 7 years ago. ZNC works for me.png​ (105.4 KB) - added by renatosilva 7 years ago. Everything below "Use SSL" on the "Advanced" tab is provided by the IRC Helper or IRC More plugins, and aren't relevant here because they're third party plugins (regardless of the fact that some Pidgin developers have been involved with their development over the years). That said, the "Auth Name" and "Nick password" fields (provided by IRC Helper, which you probably shouldn't use in this case) are for connecting directly to real IRC networks and identifying to services bots such as NickServ, not some bouncer that pretends it's an IRC server. The "Use SSL" checkbox is not on the "Basic" tab because it would be inconsistent with our other protocols' options. You seem to be confusing a bouncer with a real IRC server. The comments you've placed in your images are completely wrong. The "Username" field on the the "Basic" tab corresponds with your nickname on an IRC server. Admittedly, that label is not ideal, but it is labeled as such for consistency within the UI across protocols. We require that field to have a value because we expect to connect to an actual IRC server, not a bouncer. The "Username" field on the "Advanced" tab is the username that shows in your mask (for example, nick!username@host.somedomain.tld). On a real IRC server, these two fields work exactly as I have explained, not how your bouncer seems to treat them. The bottom line is, essentially, that our overall opinion of support for bouncers is that we won't do anything intentionally to break compatibility with them, but we won't go out of our way to shoehorn support for them into a protocol that already doesn't really fit in well with our IM-centric model. Ticket #15358 has been marked as a duplicate of this ticket. Even though your details are weird (e.g. username field in advanced tab below UTF-8 check is just a display option), I agree completely. It was a PITA to me find out what each of the fields do. About consistency on basic tab, when not applicable SSL option would be hidden, and username field would be renamed. That's already done for buddy icon for example, which doesn't show for IRC. One thing is it would be hard to implement and maintain, but "inconsistency"? dandv, I have a very similar setup and below is how I've got it working. 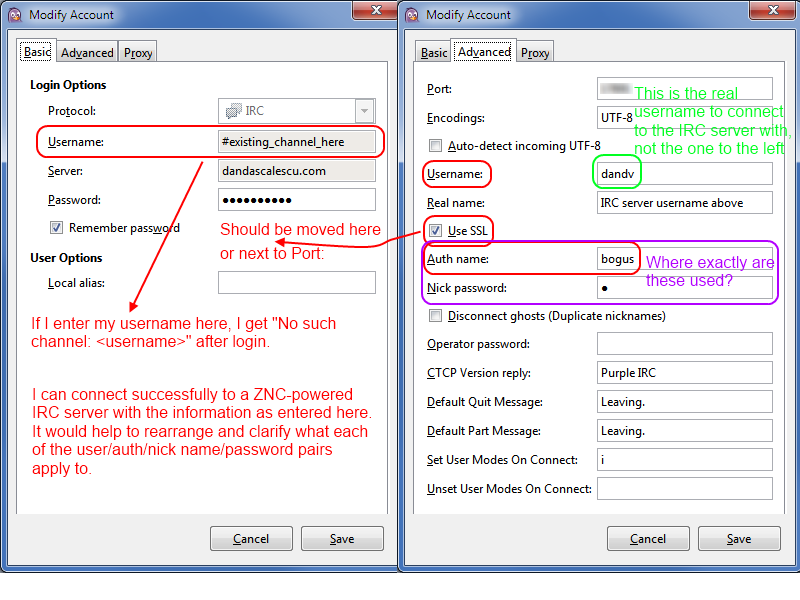 I have nickserv module enabled in ZNC, but as you can see I leave IRC Helper's nick password empty. 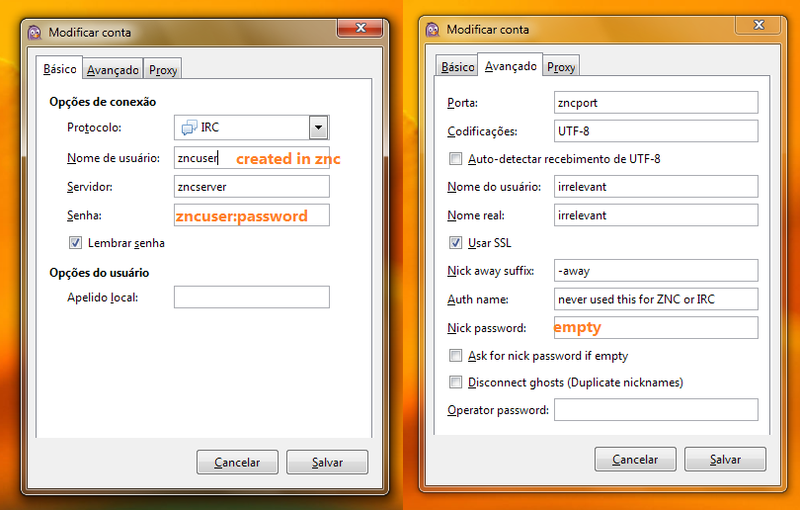 I'm not sure how it works though, maybe it's using my ZNC user password also as real nick password. Maybe it would help if plugin options were visually isolated? I assume plugins may want to modify some options without any visual isolation, so this would rather be a guideline for plugin author, than an enforced visual isolation of a plugin's display area. If plugin options were to be visually isolated, that's not something our current API would allow overriding (and I can't see any valid reason to allow overriding anyway). I don't see a problem with changing the account window so that there is a fourth tab called "Plugin Options" with individual sections for each plugin that adds options to accomplish the separation but others might. It could also be tricky to get it just right. As for my consistency argument, go look at AIM, ICQ, and XMPP as examples. The connection security/SSL options for all of those protocols are on the Advanced tab, and they're just fine where they are.